Central High School sophomore Tom Molz delivers his first film review for Cinedelphia with this in-depth look at the new high school house party film, Project X. I’ve decided to forgo editing it in order to preserve Tom’s youthful viewpoint. Recently, found-footage style films have become quite a hit in Hollywood. With the successes of such films as Cloverfield and Paranormal Activity, studios have started to take a hint as to what audiences want to see more of. So as of late, they have begun to expand its genres from horror to sci-fi/action with Chronicle. The release of the film was a great risk in whether or not audiences will be hooked by an entire shaky-cam film of a different genre. However, box office and critical success both gave the film the support needed to assure others that found-footage can successfully swap genres. However, how does Project X compare to other found-footage films in success and as a film on its own? The found-footage-style seems unnecessary to the structure of the film and lacks the successful originality that made Chronicle a success. However, as a comedy film, it breaks barriers and is as over-the-top as such party comedies as Old School and Animal House. Project X follows the story of three high school seniors as they attempt to throw a party that is sure to ear them fame and recognition among their classmates. Though there are many flaws to the film, it is for the most part well constructed and very funny as long as one doesn’t mind the vulgar writing. The Todd Philips produced film is everything you expect out of the legendary film director and more. In order to make this review more concise, I will jump right to the good and bad of the film. First I’ll deal with the bad points and work my way up. Right off the bat, it’s obvious that the film is shot with a camcorder to make it stand out as a unique work in comedy. Most of the footage is shot by Dax, a mute and often-referenced freak who adds nothing to the film besides being a sturdy cameraman. When it comes down to it though, Project X would have survived just as fine without the shaky-cam footage style. The film even takes away from the found-footage experience with choppy and precise editing along with an inserted soundtrack that continues to steal away from the realism in every shot. I doubt that a giant soundtrack in the sky follows regular teenagers every time they walk in slow motion. But I digress. The editing is used often to present a montage during certain scenes in the film, which again takes away from the realistic feel the film tried to achieve. A very important aspect to any story is the characters; ask any third-grader and he’ll tell you the same. That’s where this story fails to hook the audience. Dax is just one of the many characters that one tries to care for but fails to due to poor character development. The three leads seem as one-dimensional as an arcade version Mario game. Thomas leads the group as the birthday boy secretly in love with his best friend (yawn). Thomas’ best friends are JB (the token fat friend, about whom jokes just seem to never get old to the screenwriters) and Costa. Costa is the most appealing character because his personality reflects the true meaning of a partier. Not only is he the driving force behind the party like the tiny cartoon devil sitting on Thomas’ shoulder the entire film, he also acts parallel to the stage of the party. As the party progresses, he basically narrates how the audience is supposed to think at each individual point. This can at times be bothersome but also a clever form of storytelling. The plot is nothing clever either. Not to say the movie is boring, it’s just that a movie like this comes out about once a month but most of them fail to have the crafty dialogue and raunchy jokes this one delivers. However, once or twice the film seems like it tries too hard to be this year’s The Hangover (even if the party in this film does seem like the one that Alan and co. joined during their infamous bachelor party). The film consistently suffocates the viewers with jokes. But this is hardly a nuisance since the jokes work so well in the party atmosphere created. It seems impossible for the film to go ten minutes without Costa saying something that’s supposed to be outlandish and hilarious but sometimes comes off as rude and redundant. However, one is only vaguely aware of this when watching since for the most part, the jokes are solid. What the film lacks in originality it makes up for in dialogue. The snappy dialogue between the three leads flows effortlessly between each one and as one; the three highlight the film. Though I did mention they had weak characters, the actors themselves work so hard in the roles that they grip the audience’s attention enough to distract them from the weak character development. Each of the trio has something special to offer to the film in their respective roles and tries so hard to make something of their characters but can hardly manage that. However, the film has many more characters than just the main trio. Some secondary characters make themselves memorable in an otherwise dull supporting cast. From nut-tapping little people to the emotionless and dedicated security for the party, Project X knows it takes more than a couple of high-school nerds to make such a film memorable. Though there isn’t anything special to the direction of this film, certain aspects remain that are important to the flow of the film. Even though the editing can sidetrack the audience from the immersion they are supposed to feel in a shaky-cam film, the camerawork during the party scenes in the film are incredibly realistic. As the camera walks around the party, the audience can feel the music blasting in the background and watch as couples make out and fights build as if they were in the party themselves. This is one way that the found-footage aspect works really well. For the most part, it feels like one giant, 90-minute YouTube video of the greatest party you were never invited to. With this comes a sense of realism and believability. This aspect is a good supporting quality to the film especially when stock footage from the party the film is based on is inserted in the middle of a pinnacle scene without anyone seeing the difference. And like all found-footage films, this one to builds to a rousing climax. In a found-footage style film, if your audience is hooked in the film and doesn’t even realize the sudden transition into the climax of the film, then it is a success. That’s exactly how this film plays out: it grasps the audience’s attention and flows flawlessly from the party to the climax to the inevitable resolution without missing a beat. The resolution, though boring and predictable, does exactly what a resolution is supposed to do. It necessarily fills up any loose ends, finds suitable closure for each character and ends on a joke. So from the beginning of the film to the end, it plays out in one unbroken thread that delivers all necessary components in a film. To sum up, this film hits all the right marks while still leaving room for improvement. The comedy is vulgar and crude (as if you’d expect anything else from a Todd Philips film) and the acting is, for the most part, solid. The editing can at times be distracting while at other times make you feel like your part of the party itself. Though it may seem cheesy at times, the director was careful not to add anything extremely irrelevant and just focused on the main point of the film, which was summed up in an enjoyable 90-minutes. The plot is bland but the dialogue makes it something better than just a party movie. It’s the best party movie of this still very early decade. 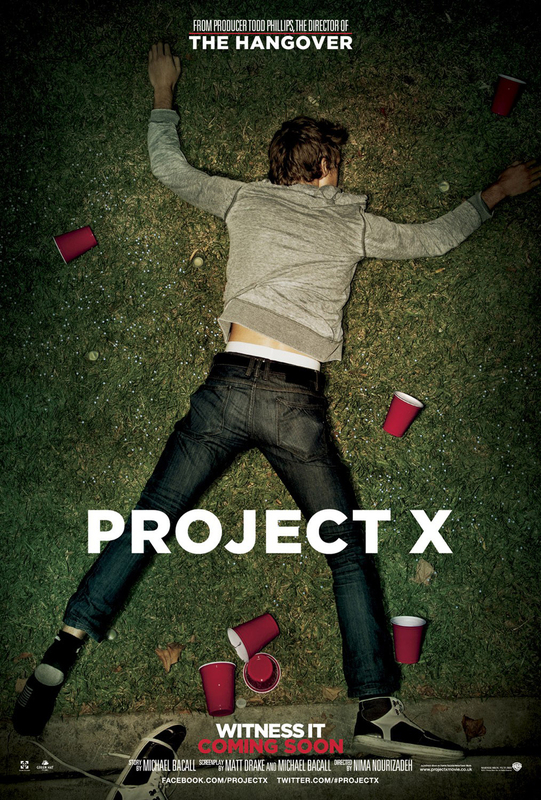 Project X opens today in Philly-area theaters. I am currently a sophomore in Central High School, Philadelphia. I am unashamedly obsessed with movies and just about everything nerd. Whether it’s a classic or new release, I don’t care as long as it’s good. I can be shy at first but once you get to know me, you’ll find I’m pretty funny and reasonable. Favorite director: Steven Spielberg. Favorite Film: E.T. Wow… you really ripped this movie to shreds… But it’s definately a well written review. I look forward to hearing more from you.